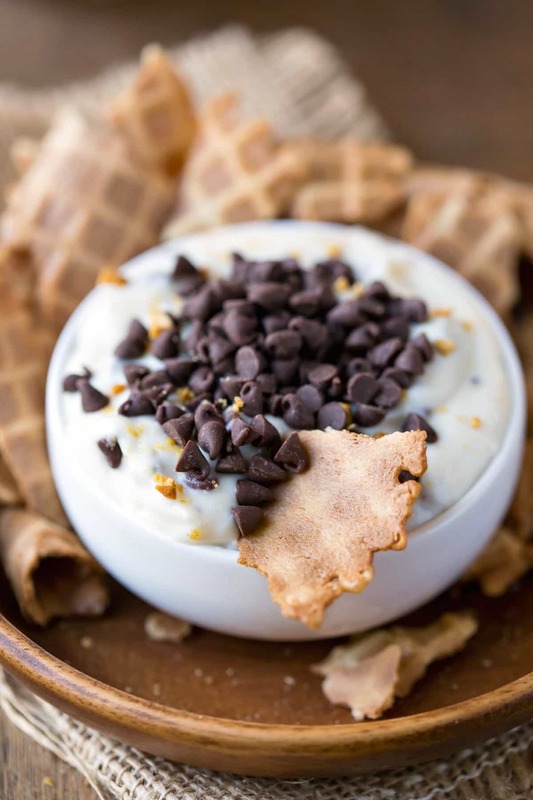 Cannoli Dip recipe makes an incredibly rich and creamy dessert dip with just 6 simple ingredients and 5 minutes of prep! Sometimes, I’m all about complicated desserts. 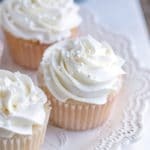 It can be relaxing to go into the kitchen and spend time making some fabulous dessert. Other times, though, it’s all about making something quick and easy that’s still super tasty. 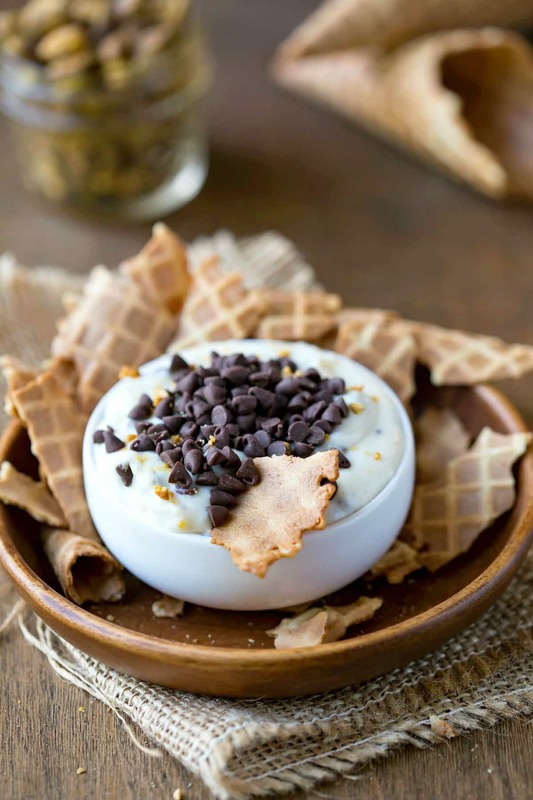 This Cannoli Dip is just such a recipe. 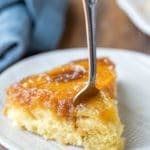 It’s creamy and sweet (not too sweet, though) and has awesome flavor. 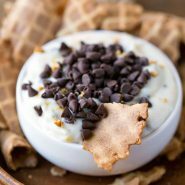 Cannoli dip is easy to make! Simply beat the ricotta and cream cheese together until well-combined. It’s ok to use reduced-fat ricotta and cream cheese, but I don’t recomment using fat-free ricotta or cream cheese in this recipe. Next, mix in the powdered sugar and extracts. Then, stir in the chocolate chips, reserving 1 tablespoon to sprinkle over the top just before serving. I also sprinkle chopped pistachios over the top just before serving. What do you serve with cannoli dip? I like to serve it with broken waffle cone pieces. You can also serve it with fruit, graham crackers, or pieces of cannoli shell. How long does cannoli dip last in the fridge? Can I make cannoli dip ahead of time? 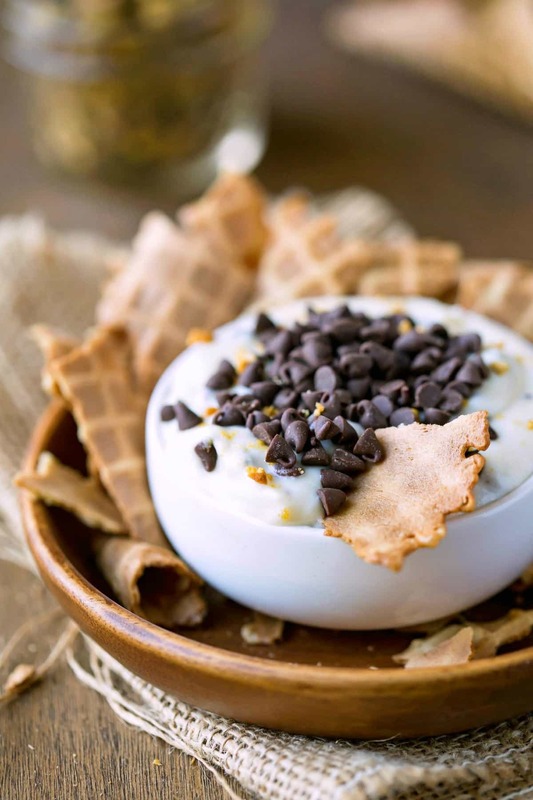 This cannoli dip is also a great make-ahead dessert option because it gets better as it sits (check out the note below for more info). 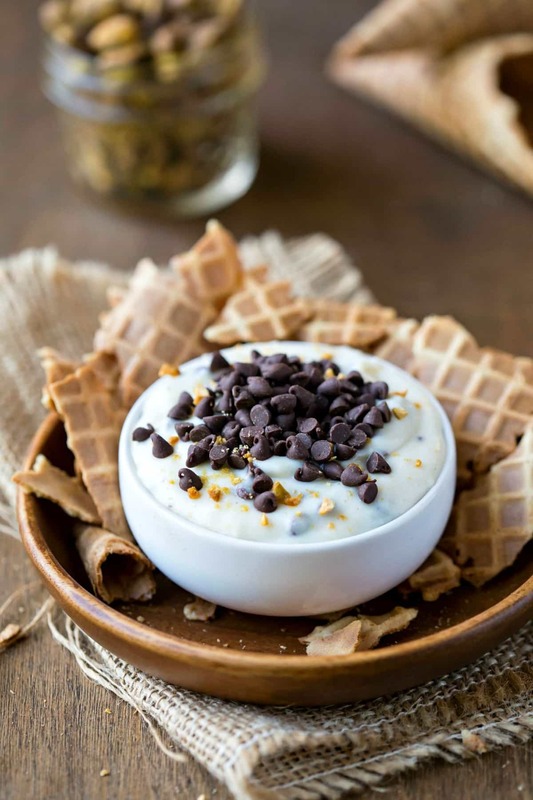 If you’ve tried this cannoli dip recipe, don’t forget to rate the recipe and leave me a comment below. I love to hear from people who’ve made my recipes! You can SUBSCRIBE to receive my latest recipe newsletters or FOLLOW ME on FACEBOOK, INSTAGRAM and PINTEREST for even more delicious food. 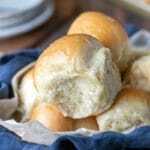 In a medium bowl, beat ricotta cheese and cream cheese together until well-combined. Mix in powdered sugar and extracts until incorporated. Stir in chocolate chips, reserving 1 tablespoon to sprinkle over the dip before serving. If desired, you can also top with chopped pistachios just before serving. Dip will thicken as it sits in the fridge and will be best if made several hours to a day ahead of time.